Great Gransden is a parish in Cambridgeshire, in the Huntingdonshire District. This web site includes information about the Parish Council, the village facilities it manages, the data and agenda for the next meetings, the minutes of previous meetings and the policies under which it operates: please see the links below and in the sidebar on the left. Great Gransden has 8 Parish Councillors - Andrew Pett, Giles Scott, Jeff Gorton, Nick Ginn, Michael Capps, Nigel Day and Peter King, who were returned following an uncontested election in 2018, and James Catmur, who was later co-opted onto the Parish Council. There remains one vacancy - if you are interested in being co-opted onto the council and to serve your community in this role, please contact the clerk or a parish councillor. Your Privacy is important to us. The parish Council takes care to safeguard the privacy of personal data supplied to us, in whatever form. A copy of our current privacy notice can be viewed online here. The current version was last edited in May 2018 to ensure conformance with the new GDPR legislation. The AGM of the Parish Council is on Thursday 18th April 2019 followed by a short planning meeting. The next regular Parish Council Meeting is on Monday 13th May 2019. The agenda for a PC meeting is published at least 3 clear days in advance; here is the one for April. For the regular monthly meetings, the clerk's report is also available to view before the meeting. 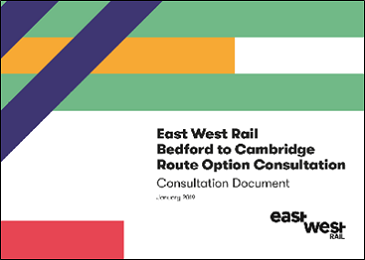 The consultation is now open and closes at midnight on Sunday 31st March 2019. 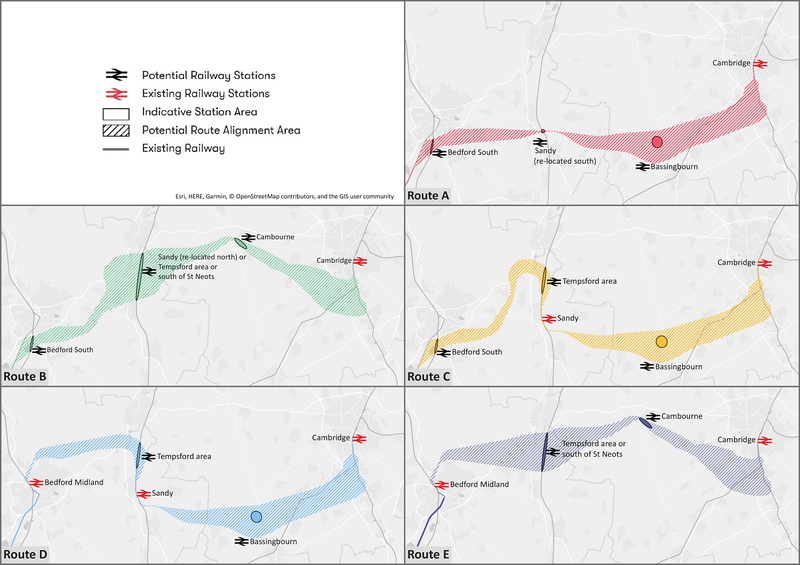 The Cambourne to Cambridge Better Public Transport Project is divided into two phases, with a new Park & Ride facility along the A428 being developed in parallel. Following initial consultation in 2015, Phase 1 consultation took place in 2017/18. 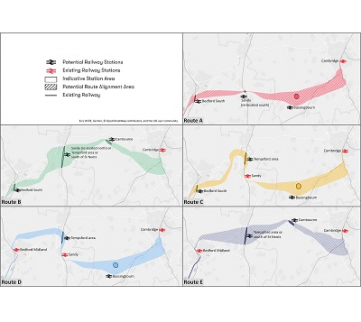 Your views are sought on Phase 2: the link west of the Madingley Mulch roundabout to Bourn Airfield and on to Cambourne, along with a new Park & Ride facility. 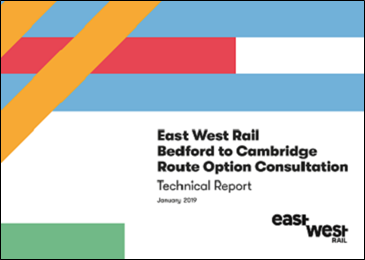 A public consultation has just started regarding the routing of a new railway between Cambridge and Bedford, part of the proposed new rail link between Oxford and Cambridge. 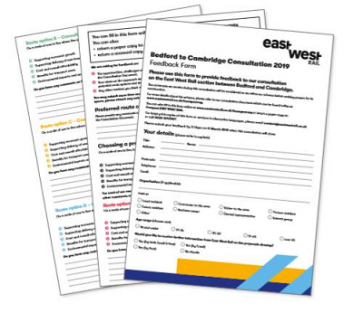 The 'Have Your Say' page (eastwestrail.co.uk/haveyoursay) contains links enabling you to download a consultation document (the best place to start), a technical report, a picture of the 5 route options, and a feedback form - which can be filled in online, or you can download a PDF version and return that by post. They say "Please submit your feedback by 11.45pm on 11 March 2019 when this consultation will close". Anyone can send in feedback - it is not limited to one reply per household - and people outside the area can also send in feedback, so you might want to tell friends and relatives about this. The Parish Council have received an update from Huntingdonshire District Council on the status of the local plan. This is given in its entirety below, and the attachments mentioned can be accessed by following the links. This is informal correspondence between HDC and the Inspector but it is publically available on our website. It is not his final report and we do not have any other additional information from the Inspector at this time. As and when we receive further correspondence we will update the website. The programme officer has forwarded the Inspector’s comments to all of those who participated in the Examination. To ensure all residents are aware of the current position a press release will be issued and that is also attached. Once he has been notified, and agrees with our position we will start a statutory full public consultation period of 7 weeks – the modification consultation. We hope to get this underway in December but that is very much dependent on the Inspectors own workload. UPDATE: The closing date for comments/observations was 13th June 2018. Sections 1 and 2 of the Parish Council's Annual Return for 2017/18 is available to view on the Parish Finance Annual Records page along with an explanation of public rights including the rights of inspection.